DocTools DocPropertyManager makes it fast and easy to manage document data and to repeat data in Word using custom document properties and DocProperty fields. You can create as many custom document properties you want to hold different data. And you can insert DocProperty fields where you want the data to appear in the document. This way, you maintain data in one place only and you can repeat the data as many times you want. In addition, it helps you secure correct and consistent content. 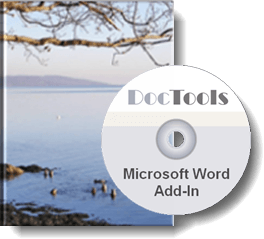 DocTools DocPropertyManager works with Word 2010, Word 2013, Word 2016, Word 2019, Word for Office 365 on PC. The add-in works with both 32-bit and 64-bit versions of Office. The add-in includes smart and unique features for working with custom document properties and DocProperty fields in Word that are not found elsewhere. Use DocTools DocPropertyManager to manage document data like letterhead info, client names, product names, titles, and other specific data in Word documents. The add-in is useful in all kinds of documents - letters, contracts, scientific reports, technical reports, technical specifications, user manuals, academic dissertations, etc. Watch the short video below and read on to learn how DocTools DocPropertyManager can help you. Single user license only EUR 57 - volume discount - see Pricing details below. The software was easy to try (full-featured free trial) and the price was very worth it when I bought the licensed copy. I've since received excellent and courteous technical support (resolved in a few hours on a weekend, no less). Needless to say, I'm a very happy customer. Thanks! The tools in DocTools DocPropertyManager are useful for both normal users and superusers who are responsible for e.g. corporate Microsoft Word templates. DocTools DocPropertyManager lets you do everything you can do using the built-in functionality for working with custom document properties and DocProperty fields - plus a lot more. Note that custom document properties and DocProperty fields created using DocTools DocPropertyManager will work as if they had been created using Word's built-in functionality. Therefore, users who don't have DocTools DocPropertyManager installed can work with your documents as they would normally do. However, they can't assign multi-line values to custom document properties using the built-in functionality. The user interface (i.e. screen texts in the Ribbon, dialog boxes, help, etc.) of DocTools DocPropertyManager can be configured to English or Danish. However, the add-in can be used with any language version of Word. DocTools DocPropertyManager is easy to use. You can start using it immediately but it is recommended to spend time on familiarizing with the functionality in order to take full advantage of all the features. Below you will find a list of some of the special features that are included in DocTools DocPropertyManager. The tools will make your work with custom document properties and DocProperty fields in Word more efficient. The commands Manage Properties and Manage DocProperty Fields let you open two variants of the same dialog box - it is your control center for working with custom document properties and DocProperty fields. The dialog box can remain open as you work. You can open it or activate it using the shortcut Ctrl+Shift+Y. ​Import custom document properties from any other Word document and select how to handle coincidence of names etc. You will find more details about the DocTools DocPropertyManager features below. See also the comparison of features in DocTools DocPropertyManager and Word's built-in features for working with custom document properties and DocProperty fields at the end of this page. Why not just use bookmarks and cross-references to bookmarks to repeat data? Custom document properties and DocProperty fields have been in use in most of my Word templates and documents for several years. I find the combination of custom document properties and DocProperty fields very well-suited for many types of data in documents. I have always found the built-in functionality in Word for working with custom document properties too limited in features. In addition, I find the user interface too inefficient to work with. Therefore, I decided to develop my own tools. I developed the first version of DocTools DocPropertyManager several year ago and I have used it on a daily basis myself. The DocTools DocPropertyManager add-in has also been part of a number of custom Word solutions I have developed for my clients. I have now improved the add-in further and extended it with extra features. Version 2.0 is the first version available from this website. Word includes a number of built-in properties (Title, Author, etc.) to which you can assign the values you want. Custom document properties are properties you define yourself. Each custom document property must have a name and a value. You can create as many custom document properties you want. Both the name and the value are limited to 255 characters. You can insert the value of any custom document property (or built-in property) by inserting a field of the type DocProperty. A field in Word is a set of codes that instructs Word to automatically insert material into a document. The field code of a DocProperty field must refer to the relevant custom document property by including the name of the property (see the illustration below). The DocProperty field will then display the value currently assigned to the custom document property. If you change the value of the property and update fields, the new value will be displayed. See the example below. Name and value of custom document property. A DocProperty field has been inserted in a document, showing the value of the custom document property as the field result. The field code of the DocProperty field. The name in the code tells Word which custom document property value to insert. You can insert as many DocProperty fields you want. In addition, any number of DocProperty fields can refer to the same custom document property. This way, you can use custom document properties to hold data and you can use DocProperty fields to insert and repeat the data in the document as many times you want. This way, you only have to maintain the value in one place. Even if you delete all DocProperty fields, the custom document properties are preserved in the document, ready for being used later. There are other methods in Word to repeat data. For example, you can bookmark a text and have the text repeated elsewhere by inserting a cross-reference to the bookmark. However, a bookmark easily gets deleted - this happens if you delete the bookmarked content - and any cross-reference referring to the bookmark will fail once the bookmark is gone. One of the very big advantages of using custom document properties instead of bookmarks is that custom document properties can exist independently of the content in the document, as explained above - they do not get deleted when editing the document content. You can also use custom document properties to hold data without using the data in any DocProperty fields. For example, you may use macros that fetch values from custom document properties to perform certain operations. Word supports four types of custom document properties: Text, Date, Number, Yes or no. You can also create all four types using DocTools DocPropertyManager. You will find detailed information about the different types in the help included with the add-in. However, it is likely that you will use the type Text for all or almost all custom document properties. You will also find more details about how custom document properties and DocProperty fields work in the help built into DocTools DocPropertyManager. The user interface of DocTools DocPropertyManager can be configured to English or Danish. However, the add-in can be used with any language version of Word. You will find a short description of each command in Overview of DocTools DocPropertyManager commands below. TIP: You can add any of the commands to the Quick Access Toolbar (QAT) if you want. To do this, right-click the desired command and click Add to Quick Access Toolbar. If you hover the mouse over a command, you will see a short description of the command. When you select a command that opens a dialog box, the dialog box will show information about what to do. In addition, the Help on DocTools DocPropertyManager command in the Help/Settings menu provides comprehensive help. The commands Manage Properties and Manage DocProperty Fields let you open two variants of the same dialog box - your control center for working with custom document properties and DocProperty fields. Both variants of the dialog box show the list of properties currently defined in the active document but the two variants let you perform different actions via buttons below the list. See the illustration below. You can switch between the two variants via the Manage field. If you want to modify built-in properties (Title, Author, etc. ), you can also switch to the built-in dialog box via the Manage field. The dialog box can remain open as you work. In addition to using the Ribbon commands, you can open it or activate it using the shortcut Ctrl+Shift+Y. 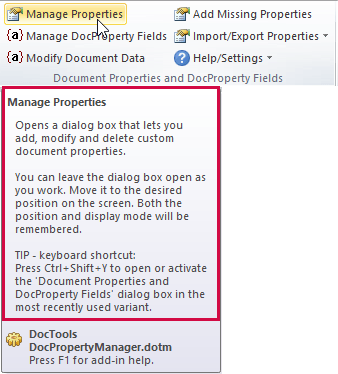 The Manage DocProperty Fields variant and the Manage Properties variant of the dialog box shown side by side. Note that the contents marked by the red frames and (1) are identical in the two variants whereas the buttons at the bottom of the dialog boxes marked by (2) and (3) are different. Also note the red info text below the list. You can see the number of DocProperty fields that use the selected custom document property. You can modify custom document properties in ways that are not possible via Word's built-in functionality. The illustration to the right shows the dialog box that opens when you click the Add button. A variant of the same dialog box opens if you click Modify. 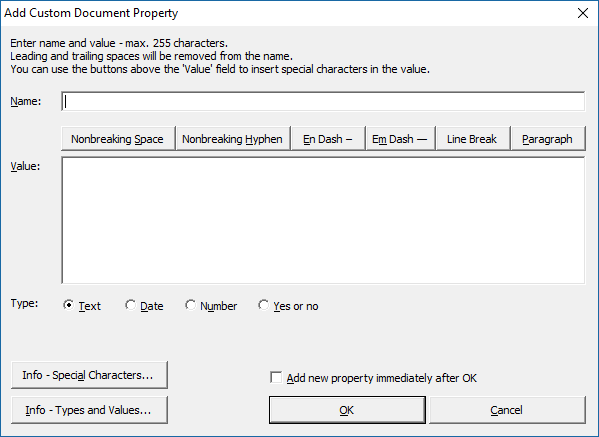 When you modify custom document properties, options let you select to automatically go to the next property and to ignore all properties that are not in use in any DocProperty fields. If you are going to add more properties at once, you can turn on Add new property immediately after OK. Then the dialog box opens again, ready for you to define the next property. In the example illustrated to the left, the document contains 684 custom document properties. It takes only a moment to reduce the list to a single property if you type a unique part of the desired custom document property name in the Filter list. The number of listed items decreases as you type. Click More>> to expand the width of the dialog box so you can see the value and type of each property in the list. Click <<Less to reduce the width. Click Long List to expand the height of the property list so you can see more properties at a time. Click Short List to reduce the height. The dialog box remembers both the size and position and the last selected property. 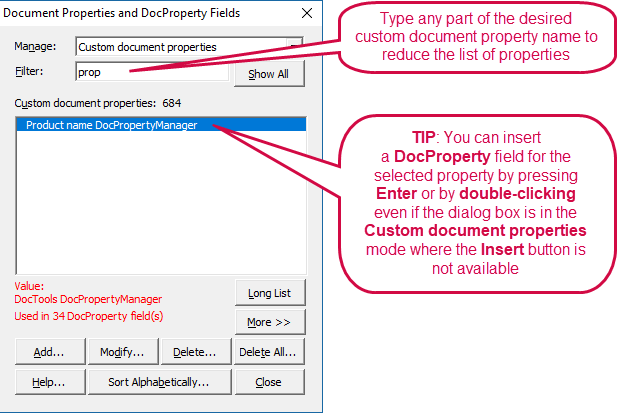 If you click More>> when the DocProperty Fields is selected in the Manage field in the dialog box, you get access to a group of Find buttons that can help you quickly locate DocProperty fields that match certain criteria. Finds the previous or next DocProperty field-felt regardless of which property the field refers to. Finds the previous or next DocProperty field that matches the currently selected property in the list. Finds the previous or next DocProperty field that shows an error because it refers to a property that does not exist. The command Modify Document Data examines all DocProperty fields in the document. For each custom document property that is referred to in one or more DocProperty fields, you will be prompted to modify the property value as needed. This way, the command makes it fast to modify data in the individual document. The command will also automatically add any missing properties (as the Add Missing Properties command). All affected fields will automatically be updated with the new values. You can achieve the same by a combination of the commands Add Missing Properties and Manage Properties > Modify button. However, that fastest method is to use Modify Document Data if the purpose is to assign values to all DocProperty fields, e.g. in a new document based on a template with DocProperty fields. If you insert content copied from another document, the copied content may include DocProperty fields. If the target document does not include custom document properties that match the DocProperty fields, those fields will show an error when updated. The command Add Missing Properties makes it possible, with a couple of clicks, to automatically add even a large number of missing custom document properties. Once added, you can modify the values as needed. Use the command Export Custom Document Properties in the Import/Export Properties menu to create a new document with a table that includes a row per custom document property in the active document. The export document will also include the full set of custom document properties from the source document. TIP: You can, for example, adjust the table in an export document to include a subset of custom document properties you need in many documents. You can then quickly import that set of custom document properties to any Word document when needed. Example of part of a table in an export document. The document also includes information about how to handle the table. You can add and remove rows, edit names and values directly in the table. When finished, use the Update Custom Document Properties in Export Document to have properties in the export document updated to match the table data. You can then use the document to import the custom document properties to other documents. Use the command Import Custom Document Properties in the Import/Export Properties menu to import custom document properties from any other Word document. If needed, you can import properties from more than one document, one at a time. 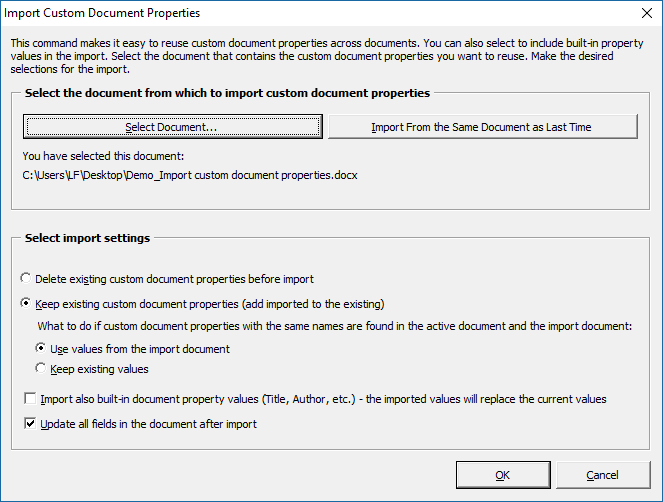 You can also import properties from a document created using the Export Custom Document Properties command. The Import Custom Document Properties dialog box lets you select how to handle existing custom document properties in the target document, etc. You can also select to have the built-in property values (Title, Author, etc.) imported at the same time. The imported values for the built-in properties will replace the current values in the target document. Note that the look of the icons vary depending on the version of Word. Opens a dialog box that lets you add, modify and delete custom document properties. You will find more details above. See also the command below. You can toggle between the two variants directly from the dialog box. 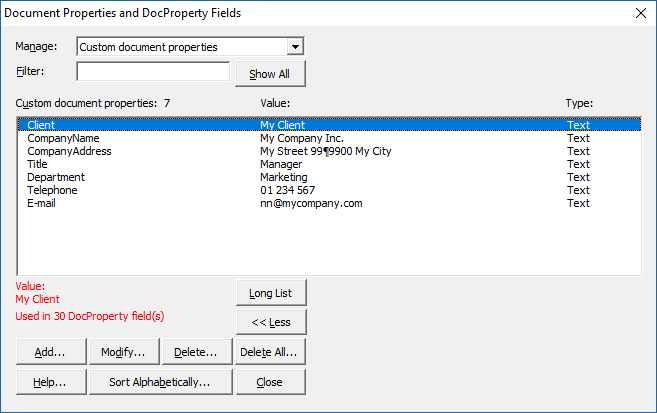 Opens a dialog box that lets you insert DocProperty fields, search DocProperty fields, etc. You will find more details above. See also the command above. You can toggle between the two variants directly from the dialog box. Lets you modify values of all custom document properties that are in use in one or more DocProperty fields in the document. The command will also automatically add any missing properties (as the command below). You will find more details above. Checks all DocProperty fields in the document. 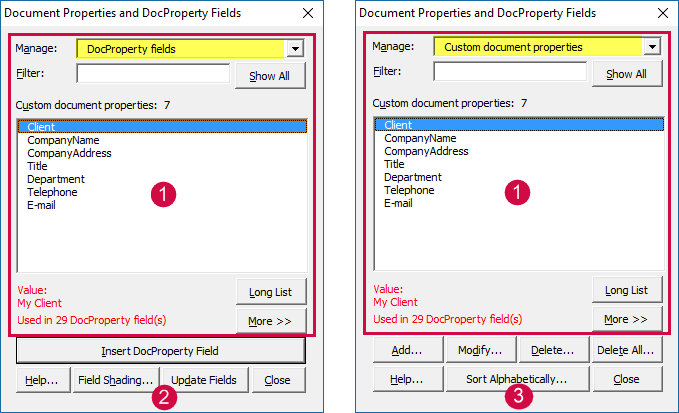 If DocProperty fields are found that refer to custom document properties that don't exist, the command will automatically add the missing custom document properties. You will find more details above. Lets you import custom document properties from any other Word document, incl. a document created via the Export Custom Document Properties command. Lets you export custom document properties from the active document to a new document. The properties will be listed in a table for easy overview. You may modify properties directly in the table. The active document must be created via the Export Custom Document Properties command. Use this command to update the properties in the document if you have manually changed the table that lists the properties. Provides help and tips related to DocTools DocPropertyManager. You can print the help or save it as PDF as needed. You can also open a User's Guide from the window. Opens a dialog box that lets you select whether screen texts in the tab, dialog boxes, etc., are to be displayed in English or Danish. See also the comparison of features in DocTools DocPropertyManager and Word's built-in features for working with custom document properties and DocProperty fields at the end of this page. If you want to try out the add-in before you buy, click the Free Trial button and follow the instructions. The free trial version includes all the functionality of the full version and will work for 15 days. Click a Buy Now button above to start the secure order process. All orders are processed securely by MyCommerce Share-It and are delivered online instantly. You can select from a large number of currencies on the Share-It order page. The price in other currencies than EUR vary based on the currency exchange rate. You will receive license key and further instructions via email. If you have questions about orders, payment and delivery, please consult the Share-It Customer Care Center. If you have any other questions, please check the Support - How to menu and the information on the individual add-in pages you can access via the Products menu. If you don't find an answer to your questions, please do not hesitate to send your questions to DocTools via the Contact form.